In September, UI grad student Tristan Amaral, Juneau local Mary Gianotti, and I traveled up to the Lemon Creek Glacier to recover seismic and other equipment set up at the end of June. The seismometers, GPS receivers and pressure gauge we’d installed will help us to better understand the evolution of subglacial hydrologic systems, and their impact on glacier flow. This work was made possible with a University of Idaho seed grant. This fieldwork also represented the first deployment of new seismometers owned by the University of Idaho Glacier Dynamics Group, and so was a valuable test of the sensors, and their in-house constructed enclosures and power systems. I’m happy to report that data recovery was very nearly 100% and that our station enclosures kept everything dry. With the hard work, positive attitudes and safety consciousness of our field team, we recovered all of the sensors that had been left out, with the additional help of a little skillful helicopter piloting. This success was in spite of the 4.2 meters of snow and ice melt that had occurred since installation, and weather at the beginning of our field time that left us rather soggy. I’m looking forward to digging deeply into the data collected, and collaboration with our partners on this project at the University of Alaska Southeast, Caltech, and the University of Grenoble. I’m just back from Taku Glacier, Alaska, where UI grad student Margot Vore, UT-Austin grad student Taylor Borgfeldt, and I retrieved new seismic data from a network set up on and around the glacier. We had a great trip, and were treated to unexpectedly phenomenal weather, with warm air, and clear, calm skies. The seismic data we collected will form the foundation for Margot’s MS thesis, and a paper examining the temporal and spatial evolution of subglacial discharge through the melt season. We’re looking forward to digging into the data. This project was initiated with Jake Walter, at the UT Institute for Geophysics, and is part of a much broader collaboration on the dynamics of the Taku Glacier terminus, with glaciologists and seismologists from University of Alaska Southeast, University of Alaska Fairbanks, and Central Washington University. The Uummannaq region of West Greenland is a spectacular area of steep cliffs, icefalls, and long fjords. While on a NASA-funded research project to better understand the connections between water in these fjords and the glaciers terminating there, I’ve had the extraordinary opportunity to fly, camp, hike, and work in this landscape. Now, you can get a taste for our work in a 4-minute movie set to music, that draws on video footage from 2015 fieldwork, and time lapse imagery from 2013. I hope you enjoy it! Thanks to Sophie Gilbert (University of Idaho) for producing this movie. One of my two presentations at the AGU fall meeting this year is the subject of a well done blog post. In the presentation, my co-authors and I reported the detection of over one million icequakes produced near the terminus of a tidewater glacier in west Greenland. Study of these icequakes will allow us to better understand the factors controlling the flow of glacier ice, and ultimately allow scientists to make more precise predictions of sea level rise. We’re presently about half way through the meeting this year and its been a good week so far. During the Saturday and Sunday prior to the beginning of the AGU fall meeting, I participated in a planning workshop to lay the groundwork for a monitoring network to observe ice-ocean interactions in Greenland. I made the case for the value of seismology in understanding tidewater glacier dynamics. My second invited presentation is a poster on Thursday afternoon. I’ll be sharing observations and interpretations of high-rate velocity variations near the front of one of Greenland’s largest ocean-terminating glaciers. The presentation is C43B-0805 High-resolution, terrestrial radar velocity observations and model results reveal a strong bed at stable, tidewater Rink Isbræ, West Greenland. 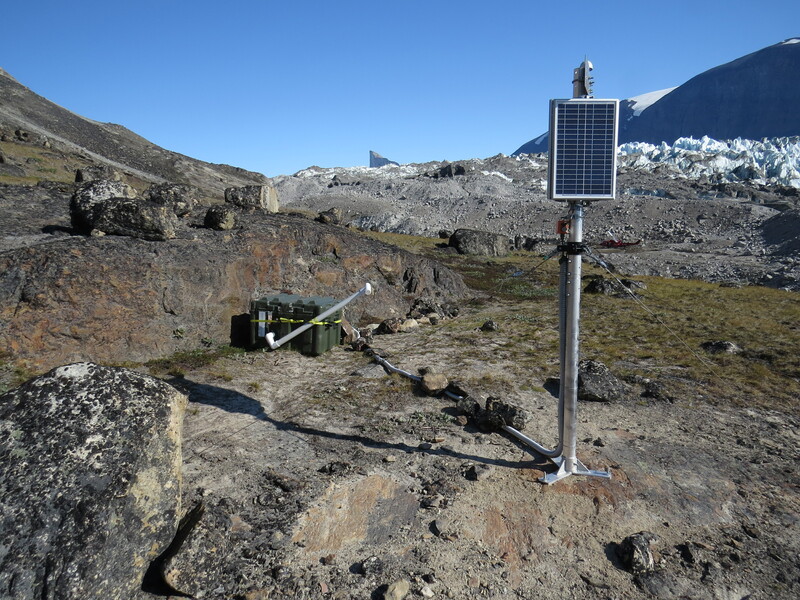 A seismometer deployed at the terminus of a west Greenland glacier for two years, between 2013 and 2015. This station recorded over a million icequakes, year-round. After spending September in Greenland, the UT/KU team has returned from our third and final field season in the Uummannaq region of western Greenland. We recovered equipment that has been monitoring tidewater glaciers in the region for two years, as well as made a set of shorter-term, higher-resolution observations that required us to camp adjacent to one of the glaciers for 10 days. We’re looking forward to working with the data, and sharing our results at this fall’s AGU meeting, future conferences, and in publications. The seismometers, GPS, timelapse cameras, and weather stations we recovered were in great shape. We also recorded excellent terrestrial interferometric radar observations (in spite of strong, consistent katabatic winds) and more seismic and GPS data. Due to the lateness of our field work (our previous field work has been in July and August), we also got to experience the transition in seasons, from fall to winter. This meant wonderful twilight, rich red tundra, and the first snows on the mountain tops. You can read more about this interdisciplinary, NASA-funded project here. At the annual meeting of the Program for Arctic Regional Climate Assessment (PARCA) hosted at the NASA Goddard Space Flight Center, I’ll be presenting new data that allow a more complete view of the iceberg calving process. These data include ground-based radar interferometry, seismic, and ocean current observations that reveal how major calving events proceed over 10s of hours before, during and after an iceberg detaches from the terminus. This PARCA presentation will be the first view of these data, collected during the 2014 summer at the terminus of Rink Isbrae in West Greenland. Further analyses of these data, taken together, will contribute to our understand of how and why calving occurs at Greenland’s largest outlet glaciers, and what the effects of these events are on the glaciers and adjacent ocean. The PARCA meeting takes place on January 27th in Greenbelt, Maryland. You can read more about the project that supported collection of this data here. Unwrapped radar interferogram from Rink Isbrae in Greenland, following a major calving event. The colors represent relative rates of motion towards the radar interferometer. Data is shown here in a polar reference frame, with distance between the radar shown along the x-axis and look direction shown along the y-axis. University of Idaho, in Moscow, is in the Pacific time zone.